Geographic Visualization: Concepts, Tools and Applications is a ‘state-of-the-art’ review of the latest developments in the subject. It examines how new concepts, methods and tools can be creatively applied to solve problems relevant to a wide range of topics. The text covers the impact of three-dimensional displays on user interaction along with the potentialities in animation and clearly explains how to create temporally sensitive visualizations. It also explores the potential for handling mobile data and representing uncertainty; as well as the role of participatory visualization systems and exploratory methods. An introduction to the diverse forms of geographic visualization which draws upon a number of theoretical perspectives and disciplines to provide an insightful commentary on new methods, techniques and tools. Richly illustrated in full colour throughout, including numerous relevant case studies and accessible discussions of important visualization concepts to enable clearer understanding for non-technical audiences. This book is an invaluable resource for all graduate students, researchers and professionals working in the geographic information sector, computer graphics and cartography. Martin Dodge works at the University of Manchester as a Lecturer in Human Geography. His research focuses primarily on the geography of cyberspace, particularly ways to map and visualize the Internet and the Web. He is the curator of a web-based Atlas of Cyberspace (www.cybergeography.org/atlas) and has co-authored two books,Mapping Cyberspace (Routledge, 2000) and Atlas of Cyberspace (Addison-Wesley 2001), both with Rob Kitchin. Mary McDerby is visualization support officer in Research Computing Services providing visualization, computer graphics, multimedia and image processing services to the University of Manchester. Her research is in the visualization of complex datasets within a virtual reality environment, as well as medical visualization. She is active in both national and international computer graphics/visualization communities such as Eurographics, and has been a co-editor of the proceedings of the UK chapter for the past three years. Martin Turner is the Visualization Team Leader within Research Computing Services at the University of Manchester. He gained his PhD in the Computer Laboratory, at Cambridge University. His research in visualization and image processing has resulted in a Fellowship with British Telecom, a published book, Fractal Geometry in Digital Imaging (Academic Press, 1998) as well as over 50 other publications, and he has supervised to completion seven successful MPhil/PhD students. Key activities and grants cover both local and nationally funded high-end visualization services as well as commercial contracts. 1. 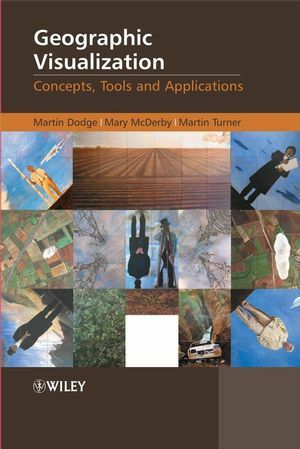 The Power of Geographical Visualizations (Martin Dodge, Mary McDerby and Martin Turner). 1.2 The nature of geographic visualization. 1.4 Digital transition and geographic visualization. 1.5 The politics of visualization. 1.6 The utility of geographic visualization. 2. What does Google Earth mean for the Social Sciences (Michael F. Goodchild). 2.2 Major features of Google Earth. 3. Coordinated Multiple Views for Exploratory GeoVisualization (Jonathan C. Roberts). 4. The Role of Map Animation for Geographic Visualization (Mark Harrower and Sara Fabrikant). 4.3 The nature of animated maps. 4.4 Potential pitfalls of map animation. 5. Telling an Old Story with New Maps (Anna Barford and Danny Dorling). 5.1 Introduction: re-visualizing our world. 5.3 The champagne glass of income distribution. 6. Re-visiting the Use of Surrogate Walks for Exploring Local Geographies Using Non-immersive Multimedia (William Cartwright). 6.6 Melbourne Historical Buildings Demonstration Product. 6.7 Testing the user’s perception of space and place. 7. Visualization with High-resolution Aerial Photography in Planning-related Property Research (Scott Orford). 7.2 Applications of aerial photography in planning-related property research. 7.3 Aerial photography, property and surveillance. 8. Towards High-resolution Self-organizing Maps of Geographic Features (André Skupin and Aude Esperbé). 8.4 High-resolution SOM for Climate Attributes. 9. The Visual City (Andy Hudson-Smith). 9.1 The development of digital space. 9.2 Creating place and space. 9.3 Visual cities and the visual Earth. 9.4 The development of virtual social space. 9.5 The future: the personal city. 10. Travails in the Third Dimension: a Critical Evaluation of Three-dimensional Geographical Visualization (Ifan D H Shepherd). 10.2 What is gained by going from 2D to 3D?. 10.3 Some problems with 3D views. 11. Experiences of Using State of the Art Immersive Technologies for Geographic Visualization (Martin Turner and Mary McDerby). 11.2 The human visual system. 11.3 Constructing large-scale visualization systems. 11.5 The future - a better and cheaper place. 12. Landscape Visualization: Science and Art (Gary Priestnall and Derek Hampson). 12.1 Landscape visualization: contexts of use. 12.2 The need for ground truth. 12.3 Outcomes from fieldwork exercises. 12.5 The Chat Moss case study. 13. Visualization, Data Sharing and Metadata (Humphrey Southall). 13.2 The data documentation initiative and the aggregate data extension. 13.3 Implementing the DDI within the GB Historical GIS. 13.4. Driving visualization in Vision of Britain. 14. Making Uncertainty Usable: Approaches for Visualizing Uncertainty Information (Stephanie Deitrick and Robert Edsall). 14.1 Introduction: the need for representations of uncertainty. 14.2 The complexity of uncertainty. 14.3 Uncertainty visualization: a user-centred research agenda. 15. Geovisualization and Time - New Opportunities for the Space-Time Cube (Menno-Jan Kraak). 15.2 Hägerstrand’s time geography and the space-time cube. 15.3 Basics of the space-time cube. 15.4 The space-time cube at work. 16. Visualizing Data Gathered by Mobile Phones (Michael A. E. Wright, Leif Oppermann and Mauricio Capra). 16.2 What are we visualizing? 16.3 How can we visualize this data?